Next day we arrived Paro and visited our local Bhutan office. I met all the office staff, some tour guides and drivers as well as the Managing Director Mr. Dorji. We are all planning to give you a happy tour and good tour programme in Bhutan.After lunch we visited two deluxe hotels to be used for our guests in Paro. The first is the Uma Resort. This hotel is situated on the hill hidden among the trees. 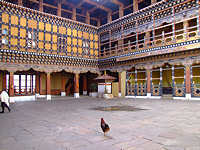 The building itself has traditional whitewashed walls with brown wooden window frames and beams all highly decorated in the Bhutanese style. There is a lovely courtyard sheltered by the four accommodation wings. . It feels like a private mansion. The second deluxe hotel we visited is the Zhiwa Ling hotel, situated near the river in a peaceful rural setting. The most stunning feature of this hotel is the lobby. This three-storey high space is entirely constructed from highly carved and decorated wooded posts and beams, like an imperial court. Natural light shines through all the windows throughout the open space lighting up and displaying the colours of this huge room. The hotel manager, Mr. Hyde, told us that all this wood carving and decoration took 64 local craftsmen three years to complete. This is an unique hotel presented by the people of Bhutan. We checked in at the Olathang Resort, a standard-category hotel we will use in Paro. 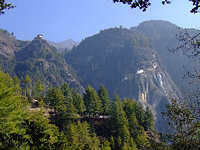 It is situated on the hill in a forest clearing with fabulous views over the Paro valley. 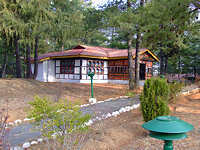 The individual villas are particularly nice, decorated in Bhutanese style and set in the grounds, so very peacful and tranquil. The room was very comfortable. There are seats at the back of the bungalow to sit and enjoy the lovely views of the hills and the valley. That evening, we had the best dinner in the hotel, especially the Indian-style chicken curry. It brought back memories of a meal I had in Delhi many years ago. All the other dishes we had on that night and on the second night were also excellent. Day 6 was the trip that I had been waiting for all these years, the visit to the Tiger's Nest. 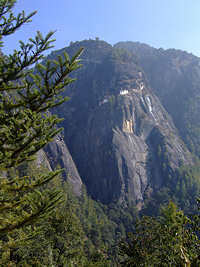 The local name is Taktshang Goemba. 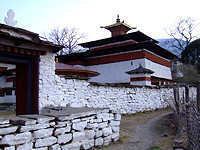 This famous monastery perches on the side of a rock face about 900m above the Paro valley floor. It takes about three hours walking to get up there. There are three stages to see the monastery. The first stage is about half way up stopping at a café with a middle-distance view of the Tiger's Nest. The second level is quite close to the monastery with a fantastic view - but the monastery is on the other side of a deep ravine. The third stage is to climb down into the ravine and up the other side to the monastery itself. Both Rob and myself are hoping to make the first level because we are no longer as young and fit as we once were. Our guide was very good to provide good wooden walking sticks for each of us, providing a very good support for our walking later on especially the downhill part. I also brought along a large bottle of water to share between us. Of course most importantly we did not forget the camera. We started energetically with numerous stops on the way. These stops and breaks are essential for drinking plenty of water and and admiring the scenery. It is also important to rest and walk at one’s own pace. Our guide did not rush us at all. He waited patiently for us. As a tour guide he walks up to this monastery several times monthly. Views of the Tiger's Nest were appearing at every corner and every turn that we made on the way up, getting larger and closer all the time. We reached the first rest stop after about an hour or so of walking, where there is a lovely café serving tea and coffee plus biscuits (free of charge - but not the souvenirs of course). From here the view of the monastery is clearer but still far away. We had a very good break and decided we would carry on to the second rest stop. The walk was still about the same level of difficulty, in fact once past the first rest stop our bodies must have got used to the pace and we felt good about it. In about another hour we reached the second rest stop. I believe I might have shouted out in excitement when we saw the Tiger's Nest right in front of us across the ravine. It was magnificent. It was so close and so beautiful. It was well worth the extra effort to walk up and see this beauty. My dream has come true in front of my eyes. It was a sunny day and the late morning sun was shining onto the gold and red pagoda roofs lighting up the whole monastery. The monastery seems to emerge from the rock standing magnificently on the edge of the cliff. We sat on the rock provided for viewing and admired this masterpiece. As I am not good with heights, I couldn't continue to the monastery itself. The steps down the side of the ravine and up again other side are without any railing or support, so we did not make the final section of the walk, but I am happy that we got to the secind viewpoint. The view will remain in my heart forever. On the way down I was thinking may be I would do it again on my next visit to Bhutan. After lunch we visited two more monasteries, one in ruins and the second one the oldest in Paro, Dumtse Lhakhang, built in 1433. The most intriguing thing there were the lay people reading aloud the spiritual texts inside the temple. They are not monks but they come and read the holy books. There were about 40 to 50 of them young and old reading loudly together in the same room. It was the end of a very exciting day. It was also the end of our very enjoyable and fascinating six day trip to Bhutan. The next day we would leave for Bangkok. The Tiger's Nest and Punakha Dzong and its festival have to be the trip of the lifetime. I would not have fulfilled my life if I have not seen them. They have filled my heart. Next day our Druk Air flight left Paro at eleven and arrived in Bangkok at about four. There was a big gap before our return flight with Thai Airways next morning at one, and so our Bangkok office friends took us to Tiger Kingdom for an extra afternoon tour. 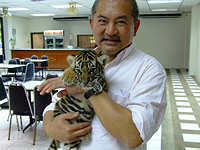 Tiger Kingdom is not far from the airport and has about 10 grown tigers and many tiger cubs. Some of them are just a few months old. We boarded a rice barge from there to travel along the backwaters while drinking Singha beer. We watched the river life begin to unfold before us. It seemed a big surprise that just a short way from the airport, and behind the motorways and flyovers, is a hidden world of local life little changed for centuries. There are houses along the canals, children were playing, some fishing and some market boats delivering their products etc. This was a very pleasant way to spend an hour on route to visit the temple and market. We finished with a delicious Thai dinner of chicken Satay, tiger prawns, fish and tom yam soup before returning to the airport for our flight to UK. We are adding this afternoon Bangkok portion onto all our Bhutan tours to fill the long connecting time at Bangkok Airport. I hope you enjoyed reading these experiences. I also hope you will visit Bhutan. I can promise you it will be fantastic.